Several things have transformed my way of working during my career as a journalist. The first, naturally, was a computer. Then came the Internet. Then the mobile phone, developing into the smartphone, with its multiplicity of uses. So it is now also my camera, my tape recorder, my computer and my information provider. I have family members who don’t use dictate software, and seemed to have little trouble putting their ideas down, at length, on a computer screen. That shows that this software isn’t everybody. But it is certainly for me. I was always a slow and inaccurate typist, although I did manage to do my job on national newspapers. I first came upon Dragon in a free programme given away on the front of a tech magazine. In those days, before you could use the software, you have to train it by dictating some fairly long passages into it. However, right from the start (at the time I was using a PC) who found it reasonably accurate, and it speeded up my work. I progressed through the various updates of the software on my PC, as it became steadily more accurate and easier to use. Five years ago I switched from a PC to the Apple MacBook, and have used this computer ever since. 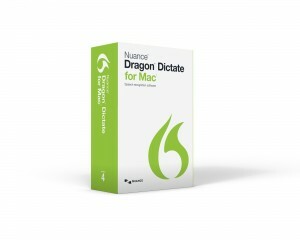 When I first made the switch, Dragon did not offer a dedicated programme for the Apple Mac. Before long it filled that gap with voice-activated software designed specifically for the Mac. This, the fourth version, is now impressively mature. There is another small, but important detail. In the latest versions, I don’t have to use a microphone. Sitting in a normal position, I speak at the screen. The internal microphone in my MacBook is sufficient. Could the dictation microphone have almost as short a life as the fax machine? 20 years ago, when there was a lot more work about for a freelance journalist, I have no doubt that, had this software been available, I would have been noticeably more productive. Much of my work then centred on interviews with TV producers and presenters. My standard approach was to transcribe the interview, by playing it back and laboriously typing it into my computer. It could easily take me a whole morning, and even longer, to capture those words. My approach today is to listen to an interview on headphones and speak the words into Dragon. I hope that before too long the software will be able to transcribe different voices on a tape – at the moment it can transcribe only, say, my voice directly from a downloaded recording. Is this a challenge that cannot be met? Looking at the progress the software has made in 10 years, I doubt it. Dragon already makes my writing life much simpler. It would probably make it simpler still if I took the trouble to read the User Manual more diligently. I’m sure I’m not alone in my aversion to reading manuals (amusingly Dragon just then gave me, somewhat hopefully, “conversion” instead of “ aversion”.) For the purposes of this article I did quickly read through the manual, which is lucid and unambiguous and downright helpful. I don’t really have any excuse for getting anything wrong if I go there looking for answers to all sorts of questions, such as navigating the Internet and writing Japanese currency symbols. It really does pay to spend some time with the handbook and writes down the commands you feel might help you. I still find this one of the niftiest features. If you’re working in a programme that does not offer full text control (where you can’t dictate text and then manipulate it through voice commands), call up the Express Editor Window. It floats above the application. You dictate directly into this box, then press “transfer” to send your words into the application you’re using. It works, effortlessly. However, for me and other disgraceful laggards, there is an easier way. It’s Twitter, and YouTube. Nuance’s Twitter feed promotes the company’s brief (around 1 ½ minutes) helpful tips, “Ask the Dictator”, from Peter Mahoney, Nuance CMO and General Manager. He is already on to number 85. I now understand how to navigate on the web, how to transcribe from audio recorder recorder and how you use your voice to relieve repetitive stress injury. DragonDictate has a vast amount more to offer, from that helpful list of suggested alternatives to the sentence you just typed, to the facility to issue commands to control most of the functions on my computer. One of the benefits of dictation software is that it lets you quickly set down thoughts, and then dictate another form of words just as quickly to see if that works better. Writers have always done this, of course, with pens and typewriters, and a lot of associated agony. I know. In the past I have been able to work at speed, clattering away on a typewriter, up against a deadline. But with Dragon this is speed of a different order, with the mental stimulation feeding back into the creative process. Adrenaline and endorphins come to mind, but I’m not a neuroscientist. I just know it works for me . How accurate is my dictation with the latest version? Is it higher than Dragon 3? Impossible to say, and I don’t really need to know. I’m now finding that provided I don’t gabble on – and Dragon did have a problem with “gabble”, so it was worth the few seconds to correct it, for future reference – for my purposes, writing fairly short articles and e-mails, the software is about as good as it could be. Dragon Dictate for the Mac has become a powerful assistant, willing to take over most, if not all, of the tedious work I used to do on the keyboard. But I mustn’t forget the manual. So where does a technology go when, as far as this writer is concerned, it has more or less already met my expectations? Nuance is working with companies to bring speech to devices. It’s the software behind the speech recognition technology being introduced in cars. It’s also being adopted in smart TVs, by Panasonic. The company’s Twitter feed is talking about speech solutions in healthcare, driven in part by the move to Electronic Patient Records and a paperless NHS. Health professionals will be able to capture so much more data, and much more quickly, when they dictate. I speak as somebody who marvelled at how much the photocopier could help me at university. I am no futurologist, but I can easily see a time when computer manufacturers could dispense with the keyboard altogether. Communicating with other human beings by speech and facial gesture has endured for many thousands of years. Writing things down is very new. We have moved from handwriting devices scratching on stones, through to brushes on parchment and pens on paper, then on to printing presses and typewriters. Human fingers have been the principal means of creating words, either as a way of holding the pen or tapping the keys, and most recently touching a virtual keyboard on a smartphone or tablet screen. Is this going to be a transient technology? Already many of us are hardly writing with a pen. Is it possible that few of us will be using our fingers to input digital information 20, still less 50 years from now? Nuance’s quite brilliant, transformative technology makes that a distinct possibility.